The single most important task a foodservice professional can do to help ensure the success of their business is to use a food cost calculator to begin building their business plan. Clients ask us all the time if we could recommend a free food cost calculator to help them with this task; so we searched the internet far and wide, and unfortunately, we found no “simple” free food cost calculators out there, so we decided to create our own, for you to use free of charge. Learning how to prepare a food cost analysis is not a trade secret, and you do not need to attend the finest culinary schools to learn how to do it. It is however essential that every chef and restaurant owner have a basic understanding of how it works. Our free food cost calculator below is simple to use, and you can even download or print your work to make changes in the future. 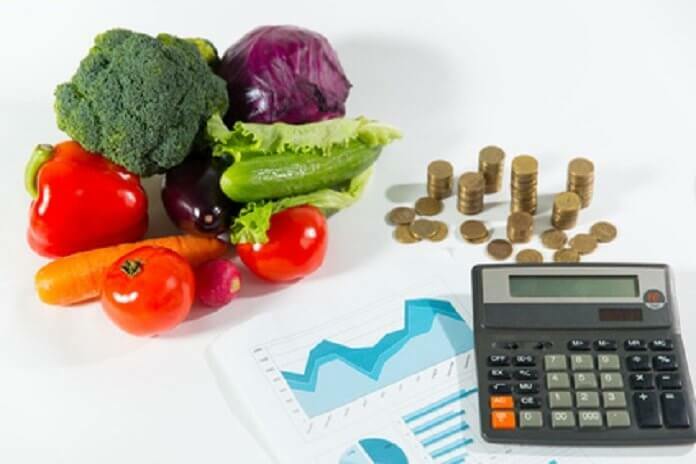 Before you get started, we recommend you review our Post “How to Create a Food Cost Analysis,” so you’ll gain a better understanding as to how the calculator works. This calculator format is of our own design, so we’ve locked some of the cells and formulas within it to make sure no one makes the mistake of altering the way it works. Besides that, the free food cost calculator is completely customization to fit your recipe. Quantities of each ingredient and their associated cost designation. For example: you will buy flour by the pound (or kilogram) so your recipe quantity and cost should be in ounces (or grams). AP Cost is the “As Purchased Cost.” If flour costs say $2 for 10 pounds, then the AP cost would be $.0125 per ounce. Yield % reflects the amount of usable product from an ingredient after fabrication. For example: If you purchase a watermelon for a recipe and you determine that on average, 20% of the watermelon consists of rind that you cannot use, then your Yield is 80%. New Fabricated Cost updates your ingredient cost after accounting for the discarded part, such as the rind of the watermelon in our example above. The final item you will notice at the bottom of the ingredient list is an item called “Utility.” We recommend all chefs include a utility cost associated with each recipe to account for those items that may be needed to create the recipe, but cannot be quantified within it. For example: You need to wash your hands before you cook, but you cannot quantify the amount of hand soap and paper towels that may be used in creating it, so you assign a Utility cost to cover these expenses. Every restaurant will have a different Utility cost, but it shouldn’t be more than a dollar or so per recipe. Once you’ve used the free food cost calculator to compile all your recipes, you can use this information as the basis to generate your restaurant budget and subsequent restaurant business plan. Keep in mind that this is only one component of a comprehensive restaurant budget or business plan, so if you require assistance, you are welcome to contract one of our restaurant consultants here. We’ve helped develop dozens of business plans with clients over the years, and know how daunting of a task it can be when you are starting from scratch. We always recommend using a software platform to make things easier after you’ve completed your food cost analysis. Palo Alto Software has several programs to help entrepreneurs develop their business, sales and marketing plans. We encourage all of our clients to use since it makes life so much easier, theirs and ours! We’ve placed some links below to their software that you can view by clicking the banner.